I could tell you that it’s a misconception that marketers spend a lot of time trying to figure out how to sell more stuff to more people every holiday season. Of course, I’d be lying. Every holiday season, brands scramble to find new ways for people to excitedly part with their money is in full swing – with mall Santas and all. The day before Black Friday, the TV ads for early deals, discount finding websites, and price locator apps are tough to avoid these days. Even for those who don’t make a regular habit of shopping (like me!) can’t help but be romanced by the promise of $250 HDTVs and 85% discounts on historically overpriced items. Yet among the rampant consumerism is a victim that is starting to get more and more media attention as Black Friday approaches – the lowly retail worker. Paid by the hour and often forced to cut their own Thanksgiving holidays short in order to show up for work, the people working in retail have a tougher job than anyone as frantic shoppers fall over each other for the best deals. They have to put up with cranky customers, a lack of resources, undesirable working hours, and criticism for things that often aren’t their fault. So what’s a human empathetic customer to do? Boycotting the sales probably won’t work – because those retail workers will need to show up whether you do or not. And most of us probably don’t have the time to launch our own retail workers rights programs. Instead, here are three ideas inspired by one of my favorite satirical books on retail culture called Pretending You Care by cartoonist Norm Feuti. Not only could they help you transform one worker’s overall happiness this crazy holiday season … but they might just give you some much needed karma in the process. Yes, sometimes products run out and not every store will have an in stock guarantee. But if you were trying to get tickets on a flight and it was sold out, you wouldn’t ask the pilot to find two more seats or threaten to sue. Instead, you’d move on, get a different flight and get over it. Stores run out. It’s ok. You will find some things you want and some things you won’t. Get over it. 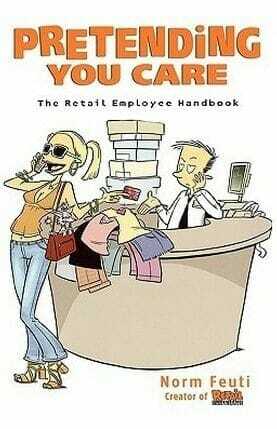 The fact is, many retail workers won’t have all the answer about products they only learned about a few weeks ago. And they certainly won’t have the answer if you choose to ask stupid questions. The smart workers, as Feuti suggest, will become adept at making stuff up on the spot. Sometimes it will be entertaining. Sometimes it will just be an answer that you know sounds wrong. If you get one like that, accept it and move on. Maybe ask someone else. There is no upside for them to withhold information – so persisting is like asking a tourist for dinner spot recommendations in an unfamiliar city. No matter which words you choose, you probably won’t get a great answer because they just don’t have the information you are asking for. If there is a sad fact about retail, it’s that you’ll rarely meet a worker with the same wit and humor as Norm Feuti (who spent many years as a retail worker getting inspired to create his cartoon and write the book). Still, the lessons from his book hold true – no one wants to hear about your amazing philosophy of life in a retail environment. Least of all when it’s busy and there are lots of customers. It was several years ago that I first read Pretending You Care, but it changed the way I thought about being a consumer. The day before Black Friday seems like the perfect time to bring back some of those lessons. Of course, you might just forget about all this when staring at the last of the insanely priced HDTVs left on the shelf. Just remember being kind always matters – even if you don’t believe in the big guy who tracks when you’re naughty or nice anymore.